I am a haunted man. I don’t mean haunted in a supernatural sense (although there was that house I rented in Rochester, New York, with an attic that burped strange noises). No, I am a man haunted by culinary specters — ghosts of meals past that linger longer, and more pleasantly, than the memories of most romances. My recent visitation was by a sour cherry pie I had eaten on Martha’s Vineyard. Not the pie, exactly, but the crust: tender, flaky and made with — gasp — lard. It came on gently, almost imperceptibly, at first. A craving here, a longing there. Soon, though, it was shamelessly seducing me with its memory of a crust that was, medically speaking, to die for. I had only one option left: exorcism della torta. The only way to free myself from this phantom was to summon it in my kitchen, wrest the secret of its crust, and forever be its master. My next stop was the Korean deli in my apartment building. The young slip of a girl behind the counter didn’t even know what lard was. What’s the youth of this country coming to? Desperate, I knocked on the window of the Mexican restaurant across the street. Surely it would have lard. But owing to the time (9:30 a.m.), the place was closed; the only life I could see was a clutch of Hispanic busboys huddled close together drinking coffee to ward off the miserable cold. “Can I borrow some lard?” I asked through the window. The boys looked at me as if I were speaking another language, which I was. Had New York’s Upper West Side become so gentrified that none of its Hispanic past remained? Or had the low-fat craze become so fixed in our psyche that good old-fashioned animal fat was anathema? Next, with nostrils flaring and eyes bulging, I flung myself on the mercy of the manager of a small supermarket. Taking pity upon me, he led me to my personal Holy Grail. There, sitting quietly upon a shelf — next to the cleaning supplies — was my own box of lard. I rushed back to my apartment, faster than my age or frame could bear, and tore through cookbooks looking for a sensational cherry pie. In my haste, I had forgotten the cherries. No matter. I would first perfect the crust, then move stalwartly on to the filling. I tried recipe after recipe, searching for the elusive flakiness and richness of the crust I had savored for years. But every one proved a disappointment. Either too bland, too dry, or too greasy. Finally, I remembered that Cook’s Illustrated had a pie crust recipe that was sheer gluttony: enough butter and vegetable shortening to send a supermodel into therapy. 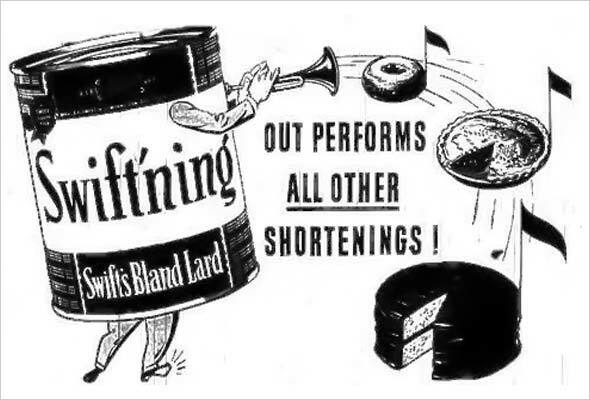 But would it work with lard? Would I finally possess that which I pined for? Would I reach the culinary heights of bakers long gone, perhaps from eating one too many lard pie crusts? Hi David! Your quest for lard reminded me of one of the best Portuguese puddings I’ve ever tasted: the famous Pudim do Abade de Priscos, whose secret ingredient is, of all things, lard (or, to some authors, ham fat). You probably came across it—and have even written about it. It’s a politically incorrect recipe for the current [culinary] times, but it’s the richest and tastiest pudding I’ve eaten. There’s a unique unctuousness about it that can only be explained by the fact that it’s made with pork fat. One of the very best I’ve tried was at a restaurant in Braga (in North Portugal) called, guess what: Abade de Priscos (Abbot of Priscos). The owner, Fernando Beleza, is a very interesting man and a curious, self-taught cook who thoroughly researches each dish before serving it. And that was the case for this iconic house dessert. Beleza claims to have inherited the true recipe for this unique desert from the famous 19th-century Portuguese Abbot-chef himself. Now the most curious note about the pudding. I used to live in Braga some years ago, and I often went to the restaurant (two, three times per week). I always indulged in a half portion of my favorite pudding; indeed, it was the only desert I had there. It was always excellent, but—this is the strange part—its taste varied considerably, to the point that we would comment on the quality and tastiness of that day’s pudding. Fernando and I often discussed and wondered why that was the case. Fernando is a perfectionist: all the other dishes he served were consistent over the years. He explained to me that even with eggs coming from the same batch, port from the same wine bottle, and lard from the same hunk of fat, the pudding would have a different taste. It depends on the weather and the mood of the cook while beating the eggs, he used to say. Looking back, I realize that one of the reasons that probably made me go so often to Fernando’s restaurant was to try that day’s pudding, with the hope it would excel that from the previous visit. It invariably did. Nuno, I have had the dessert several times, most memorably at another Braga restaurant Bem-Me-Quer. It’s a rich, decadent, and eggy concoction. The recipe from Bem-Me-Quer used three dozen egg yolks plus the lard. I played around with the idea of including it in my book, but I don’t know if a lot of my readers would make it. If enough are curious, we can post a recipe here. Here’s one person who is interested! David, Your article sent me scurrying to the bookshelf to check Jeffrey Steingarten’s The Man Who Ate Everything for a chapter he wrote on precisely the same topic. It’s titled “Pies from Paradise,” and he writes about Marion Cunningham’s method. You might want to take a look—and try the recipe. Good luck!! P.S. I render my own lard, according to Jennifer McLagan’s instructions in her book Fat: An Appreciation of a Misunderstood Ingredient, with Recipes…it’s SO worth it! Ling, I have Jeffrey’s book an will reread the chapter. Funny you should mention “Fat.” We named it our Book of the Year for 2008, and I have the pleasure of joining Jennifer in the Epicurean Classic, three days of cooking demos, tastings, book signings, and receptions. I can’t wait. Loved your feverish quest. Leaf lard is supposedly the holy grail for pies. We are lucky to have Dietrich’s Meats in NE Pennsylvania, and one of these days I will drive up there and pick some up for, yes, a cherry pie. Alonna, thanks for the kind words. You have to make a pie crust with rendered leaf lard. It’s the closest thing to a secular religious experience a cook can have.